Hello lovely readers. It's time for a gross confession... I've been having a major hair crisis! My scalp has been itchy (and flaky...ew) on and off since the fall. I've been using Head and Shoulders shampoo regularly since high school, but it was just no longer cutting it. A friend recommended that I try adding tea tree oil to my shampoo. This seemed to help me for a while, but I think it eventually caused my scalp to dry out even more! My hair is naturally very thick, but it was losing its softness, and actually starting to feel coarse. A co-worker suggested I try a hair mask. I've always thought hair masks were only meant to be applied to the ends of hair, but she suggested just giving my scalp a full pamper and really massaging the mask in. 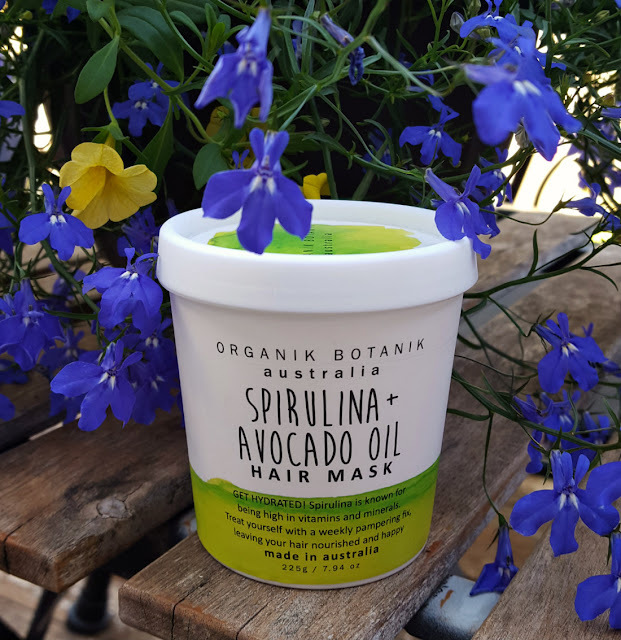 I had the Organik Botanik Australia Spirulina + Avocado Oil hair mask stashed away in my pantry, a gift I received from a friend a few months ago and kinda forgot about. I decided to give it a try, it certainly couldn't hurt, right? The mask says to apply a generous amount and let it work its magic for a 10-15 minutes. I ended up leaving it on for over an hour. It honestly made a world of difference. Even as I was rinsing it out, I could immediately feel my hair was softer than it had been in months. And my scalp is no longer itchy! The Spirulina + Avocado Oil hair mask has a nice, clean scent, which is not at all overpowering. It's thick and creamy, and rinsed out really easily even though I left it in for much longer than the recommended time. I like using hair masks, but it seems like I have the opposite problem as you with my scalp getting oily rather than dry. Do you have to apply it when your hair is wet or dry?